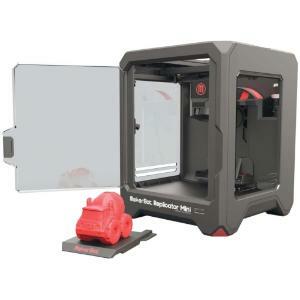 Get fast and easy One Touch™ 3D Printing! Transform a small desk in your home or classroom into an exciting creativity center. Experiment with a wide range of forms, colors, and textures. Join the large, supportive MakerBot Thingiverse® 3D design community! Print, manage, and share your 3D creations simply and seamlessly, with free MakerBot software for your PC or Mac. Reconnect with your imagination and creative power. Teach children how to think, imagine, create, craft and print in 3D. Energize and inspire children’s creativity, while preparing them for the jobs of the future. Create occasions for children to bond with parents, siblings, classmates, and teachers. Remix and customize your creations to create unique gifts for family and friends. Choose from hundreds of thousands of free, predesigned, and ready-to-print educational, entertaining, and useful 3D models on “Thingiverse”. Make household utensils and replacement parts.